← TBT: Let’s get married! Posted on July 29, 2013 by Alison V.
I have recently noticed a hypocrisy within the military significant other community, and I wonder if I am the first to observe this. One of my big pet peeves with military significant others are those who think their service members, and their relationship, is “better” than a civilian. I can’t help but cringe everything I see an Instagram or Facebook insulting and putting down civilians. 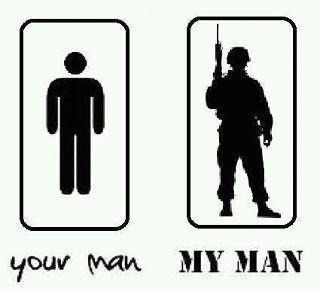 As if joining the military automatically makes a man better or a relationship better. And yet at the same time, I constantly see women lamenting about how difficult being a military spouse is, and how undesirable it is. Is being a military spouse a fairytale romance that is beyond what any civilian relationship could be? Or is it an undesirable burden that no woman would voluntarily wish for? You can’t have it both ways ladies! I see these all the time. I think it stems from that thing where you never know what’s going on with your SO, and therefore need constant reassurance. I definitely feel like I don’t have a SO some of the time, even though I definitely do, and I want extra reassurance that I’m not waiting around for weeks and months with little contact (at best) for someone who doesn’t want me there. However some of these I think are an unfortunate manifestation of that inherent insecurity. I don’t think it’s a “better” love than civilians have, it just comes with a set of hardships people can’t relate to unless their SO is also in the military. It’s frustrating and sad to me that the current structure of the military means that only a very narrow sect of people really get what it’s like to have to say goodbye to the love of their life, and know that it might be for good. Personally I just want my manfolk to be happy, and I’m pretty sure he wouldn’t be in the civilian world. I think that they are two halves to the same whole, but are driven by separate feelings. I actually don’t find the two concepts all that contradictory. Regarding the first set, there is a culture that puts down military men of any branch as dumb or grunts. So, those cards seem to be made as a reaction saying that the SO is proud of their military member for being in the military. It plays on the “my man is more macho than your man” as a way to bypass the cultural norms of placing all the importance on what paycheck they bring home as opposed to what they do for a living. So I see the first set as a “counter-slam” that speaks more toward the military member’s worth than the relationship at hand. As to the second set, I know we’ve all been there – the long nights alone, the separation, the fear for them. And we’ve also all had someone tell us that we deserve it because we chose this life. That we knew what we were getting in to. And I feel like the second set of cards reacts to this mentality. The “must like being alone” eecard is a pretty fair reaction when you have friends who think that romanticizing the separation is the way to go. I definitely have used the argument that I chose the man not the career. I accept the hardships that come with the military lifestyle because of the man I love, but I wasn’t out to get a uniform. The third alternative is that it just depends on the moment. Halfway through a deployment and just went solo to a wedding? Definitely sentiments from the second category. Just reunited after a separation and can’t keep your hands off each other? Definitely sentiments from the first. I see your point; how it could depend on the moment and situation you are going through. I certainly have moments of “I hate the military” and “it’s not that bad”, within the course of my week lol. I guess I just see it as contradictory because one moment spouses are overly romanticizing military relationships (that “military love” is better than civilian love) and then the next moment get mad that a friend is romanticizing military relationships and tells them that it’s not glamorous and they “must like being alone”. It’s definitely a contradiction. Some of it might also be part of belonging to the group or not. The mentality of “it’s one thing for US to romanticize it; but if you haven’t been there than you can’t understand.” I don’t really agree with that mentality, but I do understand that it’s there. Well I’ve seen the first meme in various forms… With the guy being a police officer and another a firefighter.. I don’t think meme’s are meant to be thought too much into.. just read to get an immediate reaction that should’t be thought further on.. 😉 I think these ones in particular are supposed to show the pride that wives should feel in the career their SO’s have chosen. I don’t find my husband’s career romantic. Submariners are a gross dirty lot… I find him romantic in the things he does to show me he cares whether he’s home or underway. I agree, for the most part I think those E-Cards are not ment to be taken too seriously. I think it’s just a pet peeve of mine because it basically puts down civilians, and I don’t really find that funny. For example, the other one I’ve seen in various forms is “If your with a Marine/Firefighter/Police Officer/Truck Driver/Whatever raise your glass, if not raise your standards”. So anybody who is married to someone whose does not do what your spouse does for a living needs to raise their standards? I knew it’s just meant to be cute and supportive, but I think there is a way to be proud and supportive of your spouse without putting down everyone else. I love reading your blog! Just want to give you kudos. I recommend it to a lot of military spouse friends!! So right on! So frustrating!